There's a saying in the comic industry that every character is somebody's favorite. Yeah, well, not this guy. British archaeologist Ashley Halberstam was at a dig in Giza, Egypt when he was engulfed by a bolt emanating from a laboratory on New Genesis. The bolt transformed Halberstam and conferred upon him the ''Power of the Pyramids,'' as channeled through his magical pyramid staff. Virtuous and heroic by nature, Halberstam fought alongside Superman, Batman and Wonder Woman against the evil machinations of Darkseid and the legions of Apokolips, eternal enemies of New Genesis. Wait, seriously? That's his origin? 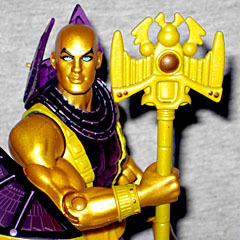 Golden Pharaoh is one of those characters carried over from Kenner's Super Powers line, rather than being an actual DC character. He never appeared on the cartoon, only ever showed up in one issue of the comic and was a peg warmer when he was released in Series 3 of the original Super Powers Collection. Mattel probably could have made up an origin for him and nobody would have been any the wiser, considering how completely unknown he was before this figure was announced. Maybe he can be part of DC's upcoming reboot - it certainly wouldn't be any stupider than starting another new Aquaman book. The Prince of the Pyramids (seriously, that's his "Dark Knight" or "Man of Steel") gets an astounding amount of newly sculpted pieces. The shins, thighs, upper and lower torso, forearms and head are all new, meaning the only parts that might be reused are the feet, loins, hands and shoulders. His boots have fancy scarab details on the knees, and the stripes on his legs are sculpted in - not even Amazo got that courtesy! The loincloth is soft pvc, so it tends to grip the waist joint, but it will move out of the way of the legs if it needs to. 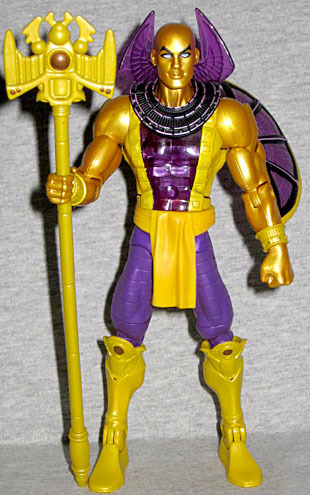 The original Golden Pharaoh had a translucent purple stripe running up the center of his torso, and this figure follows suit. This isn't the first use of translucent plastic on a DCUC figure, but it's a perfect choice. No, it doesn't make any sense, but it didn't make any sense in the '80s, either. The high collar behind his head is translucent, too, but the giant necklace thing is solid, which creates a nice contrast. 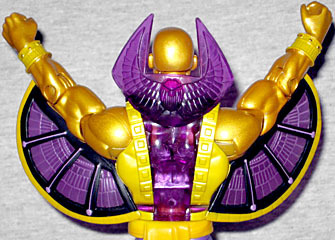 Similarly, the wings on his triceps are trans purple with black and yellow paint; the old toy was the same way, though there wasn't anywhere near as much detail in the sculpt as there is today. The Golden Pharaoh lives up to his name in his skintone. Only the arms and head are exposed, but they're unmistakably gold. It's not the same color used for Gold's gold, though: it's darker. He has kohl around his eyes, and like real pharaohs, he has a bald head (shaving is a good way to stay cool and avoid lice). The thick eyebrows and slightly cartoonish looks make him look even more "Ed McGuinness-y" than the Public Enemies figures did. The figure includes one accessory, his staff, which is the source of his abilities. Of course, since you never heard of the Golden Pharaoh before this series, you probably don't know what those abilities are. 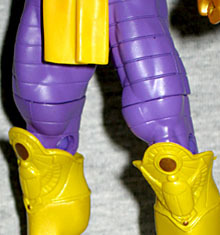 The staff (which is a detailed update of the original toy's accessory) emits "Pyramid Pulses" that create illusions to confuse and disorient his foes. Somehow that also lets him fly and turns him invulnerable. He loses his powers if he's separated from the staff for an hour, and he has to recharge the staff at the actual pyramids once every 24 hours. So it's like a Green Lantern ring, but instead of a power battery, you actually have to fly to Oa every day to re-up. The staff is 6⅞" tall, has gold paint apps for the gems, and can be held in the figure's right hand - the left is just a fist. The original 1986 figure had an action feature that would raise his arms to a "flying" pose when you squeezed his legs, but this one beats that by instead having lots of articulation. Golden Pharaoh doesn't include a piece of the Series 15 BAF, Validus, only the DC 75th Anniversary collector's pin. The final pin we have to review, unless I miss my guess. The buttons first showed up in Series 12 (which we began reviewing one year ago tomorrow - how's that for a coincidence? ), but they're not in Series 16. Ah, relief! No more hunting for art sources. Goodbye, stupid buttons! You were an effort to disguise the price increase, and you won't be missed. Oh, we should also probably mention that there's a typo on the packaging: the graphic designer was obviously building each new file on top of the last one completed, and forgot to change the "first appearance" info from Starman's card - it still lists 1941 and 1994, rather than the proper 1986. Don't feel bad, designer: we do the same thing, and mistakes happen. Golden Pharaoh was probably meant to be part of the Superfriends' more diverse cast, but rather than being an actual Egyptian, he's some random British dude named Ashley Halberstam? The second-whitest name imaginable? (The whitest name imaginable, of course, being Benedict Cumberbatch, who could only sound more British if his name was "Lord Benedict Neville-Clive Cumberbatch III.") It's no surprise he's never appeared in the comics. Still, if DC could make Apache Chief not-embarrassing when they introduced him to the JLA, something could be done with Golden Pharaoh. Eventually, he will appear in the "real" books - it's just a matter of time. Compare him to King Tut, who was introduced on the Batman tv show in 1966, and didn't make it into the comics until 43 years later. Who knows, maybe this toy will be the inspiration - the character may be goofy and obscure, but this is a really good figure.